RTSPECT is a free program for displaying a real time waveform and spectrum display of an audio signal. With RTSPECT you can monitor the waveform and spectral shape of sounds being played into the computer's microphone or line input ports. RTSPECT can display one or two-channel audio signals. 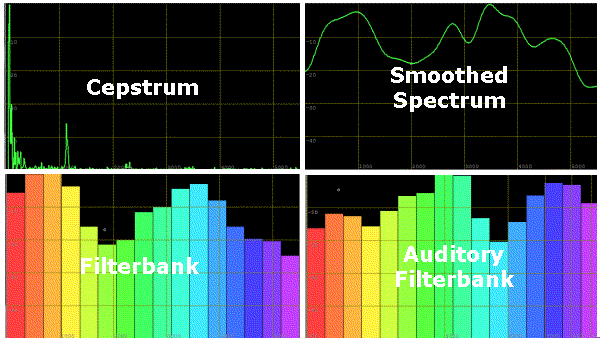 Added cepstrum, smoothed spectrum, filterbank and auditory filterbank displays. Option to set dynamic range. Add configuration options for sampling rate, frame rate and printing. Download the file called rtspect260.exe into a temporary directory. Then find and run the file to unpack and install. RTSPECT is not public domain software, its intellectual property is owned by Mark Huckvale, University College London. However RTSPECT may be used and copied without charge as long as the program and help file remain unmodified and continue to carry this copyright notice. Please contact the author for other licensing arrangements. RTSPECT carries no warranty of any kind, you use it at your own risk. FAROSON is a free program for displaying a real-time scrolling coloured pattern from speech sounds. The aim is to construct a pattern that reflects our subjective sensations of loudness, pitch and timbre. The program may be useful in teaching about the nature of sound sensation. More information. ESYSTEM is a free program for experimenting with signals and systems. With ESYSTEM you can see the effect of simple systems on a range of simple signals. More information.